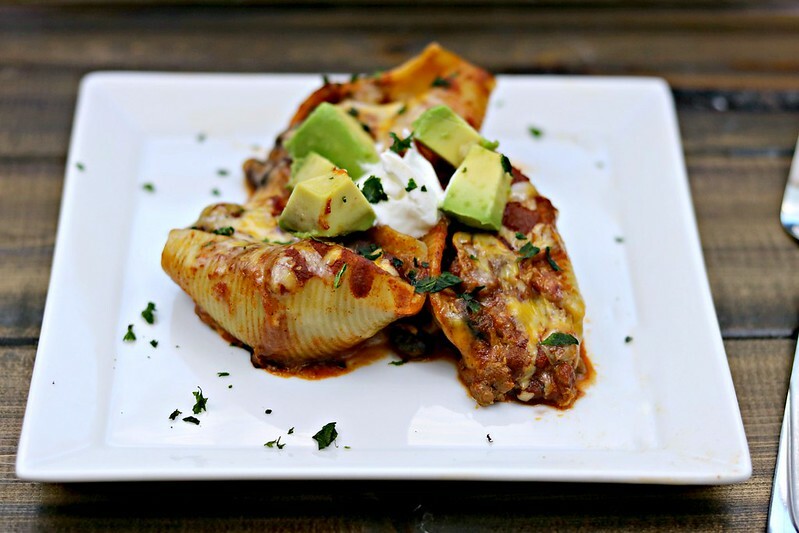 Enchilada stuffed shells have all the flavors of your favorite enchiladas, stuffed inside jumbo pasta shells for a fun twist! Lately, I’ve gotten really good and improvising on dinner. I always make a menu plan, and I grocery shop according to said menu plan, but…sometimes, the grocery order doesn’t get ordered and/or delivered until after the week has begun, which means I am missing something that I need for dinner. You see, I loathe grocery shopping, and when the whole curbside pickup and delivery thing became options in my area – I eventually gave it a shot. I was a little leery about someone else picking out my produce, etc. but I decided that I’d take my chances to not have to go in the store. And, for the most part, it’s been amazing. It’s not a perfect system, and sometimes (ok – every time) they are out of something I need, but it’s better to have to do a quick run-in on a weekday, than to have to brave the masses on the weekend. So, this past weekend, I thought I was doing so well – I got my menu plan done during the week, made my grocery list Sunday morning and went online to place the order. By the time I finished, there were no delivery slots left for the day. Which meant the dinner I planned for the night, needed some revision. 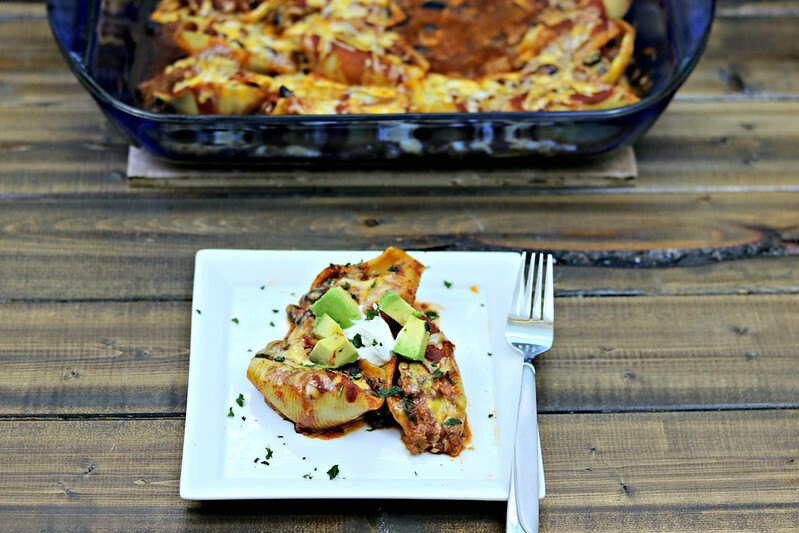 I looked in the pantry, to realize I had jumbo pasta shells, and decided that instead of zucchini enchiladas, we’d have enchilada stuffed shells! I had all the ingredients (just not the zucchini for the planned dinner), and I knew they would be so good. Years ago, I made these Mexican Stuffed Shells and I fell in love, so the opportunity to make my own version was exciting. And it did not disappoint. Bow hunting season started up this past weekend, and J got a deer on the first day – so I’m working on using up the last few packs of meat we have from last season. The ground venison was perfect in this dish, but ground beef, turkey, or even chicken would work just as well. Ground meat, black beans, lots of sauce, stuff in jumbo shells and topped with more sauce and cheese. And the topping options are endless! 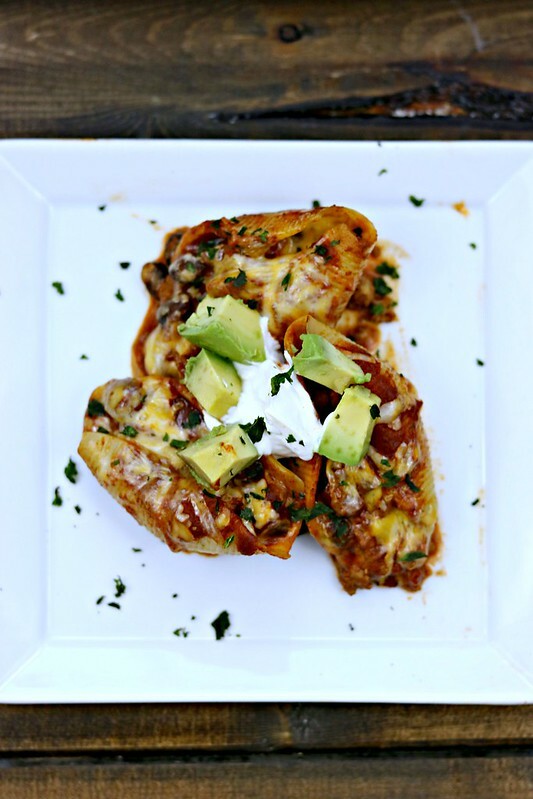 Whatever you love on enchiladas – put it on these! You will not be disappointed. Heat olive oil in a skillet over medium-high heat. Once hot, add onions and saute until softened. Add ground meat and cooking, breaking up as you go, until browned. Add the cream cheese and stir until melted. Add 1 can of the enchilada sauce and the beans, and stir to mix well. Reduce heat to medium and cook for 2-3 minutes, then remove from heat and set aside. While the filling mixture is cooking, cook your pasta shells according to the package directions, to al dente. Drain water, and allow shells to cool enough that they can be easily handled. Pour 1/3 of the remaining can of enchilada sauce on the bottom of a 9x13 casserole dish. Place the shells on top of the sauce in rows - however they fit best - and spoon the filling generously into each shell. Once all the shells are filled, pour the remaining enchilada sauce over the tops, and sprinkle the cheese evenly over all. Place in oven and bake for 15-20 minutes, until the cheese is melted and bubbly. Remove from oven, allow to cool for a couple of minutes before plating, and serve with your desired toppings. Can’t wait to try this!! Looks SO Yummy!